After months of vacation, we return to talk about the 3DS, bad Pokemon designs, Enka, loan sharks, zombies, cartography, and much more! 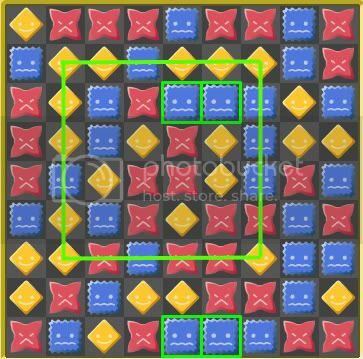 In this picture, clicking on the blue squares highlighted or the yellow diamonds in the drawn square will "clear" those blocks. The free version now has ads that weren't there before Square-Enix licensed it, and you may not be able to play past the first couple of stages, which is disappointing, because it gets even crazier later on when new shapes get added. Sadly, after the podcast, I discovered that Yosumin is pretty hard to find on the DS. Playasia and other places now list it as "out of print". When I say they don't have wi-fi, what I mean is there isn't an available public wireless signal for people to use. I'm well aware that wireless routers exist, but what I was talking about was stuff like 3G/4G networks that don't exist in many rural areas, even if you have internet service (which is why if you don't have a signal for your cell phone, it doesn't matter if you have a wireless router, you still wouldn't be able to access the internet on your phone).